This article is about Rosalina & Luma's appearances in Super Smash Bros. Ultimate. For the characters in other contexts, see Rosalina and Luma. Rosalina & Luma (ロゼッタ&チコ, Rosetta & Chiko) are playable characters in Super Smash Bros. Ultimate, controlled as one. They were revealed for the game along with the rest of the veterans on June 12th, 2018. Continuing a trend often set in the Mario series, Rosalina & Luma are now unlockable characters. Rosalina & Luma are classified as fighter #48. Kerri Kane's portrayal of Rosalina from Smash 4 was repurposed for Ultimate, as was Yuya Takezawa's portrayal of Luma from Super Mario Galaxy. Play VS. matches, with Rosalina & Luma being the 45th character to be unlocked. Clear Classic Mode with Donkey Kong or anyone in his unlock tree, being the third character in his unlock tree after Pokémon Trainer. Have Rosalina & Luma join the player's party in World of Light. With the exception of the third method, Rosalina & Luma must then be defeated on Mario Galaxy. Rosalina has received a mixture of buffs and nerfs in her transition from Smash 4 to Ultimate, but has been overall nerfed. The universal changes allows Rosalina and Luma to juggle and gimp opponents more easily but makes it more difficult for them to land and get back to the stage. All their aerials have reduced landing lag which allows them to chain moves more easily. Luma has more HP, lower respawn time, and can now be protected when Rosalina uses her shield. Star Bits has more range, enhancing its zoning utility. Gravitational Pull now auto-equips items, which makes it easier to retaliate with throwable objects (such as Mechakoopas and Gyros). Rosalina's new neutral aerial has less ending lag and offers better protection when Luma is gone. Luma also receives a new damage boost when detethered from Rosalina. This incentivizes Rosalina players to send Luma out and take advantage of her zoning potential. On the other hand, Rosalina and Luma also received critical nerfs to their potent movesets. Their neutral aerial has fewer active frames and increased startup, which makes it a less useful option for approaching. Her notorious up aerial had its endlag increased, meaning it can no longer chain to itself as easily. Luma also doesn't move forward when using its neutral attack, which severely impedes Rosalina's ability to stop approaches, ledge trap, and zone her opponents. Finally, the biggest nerf involves Luma, who now is frailer than ever, getting KO'd very easily; in addition, Luma doesn't benefit from its additional damage multiplier if tethered to Rosalina, making it less effective when paired with her. 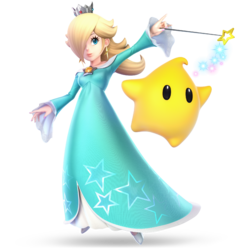 Rosalina and Luma are overall considered to be worse than their iteration in Smash 4, but to what extent is currently unknown as she has had very little tournament results in Ultimate's early metagame, although Dabuz and WaDi now keep her as a pocket character. Luma has received some noticeable buffs in patches, which has helped to mitigate the nerfs the pair obtained in the base game. As with all veterans returning from SSB4, Rosalina and Luma's models feature a more subdued color scheme. Rosalina's gown now features simple textile detailing, and has a more turquoise color, consistent with her appearances outside of Smash. Rosalina's slippers are now their usual silver, rather than matching the shade of her dress. Luma always face the screen regardless of direction it turns towards; Rosalina's stance, on the other hand, is not mirrored. As with Peach and Daisy, Rosalina's dress now has independent physics. This is most noticeable with her crouching animation; her dress fans out behind her rather than moving to her front. Rosalina's airdodge and rolls now cause a bright light to appear as she steps right or left. Additionally, her sidestep animation now features more effects as she teleports. Luma now cries out at the end of its jab and smash attacks. During Rosalina's Star KO, Luma will follow her by flying into the background, before exploding in a burst of stars once she is KO'd. When a Luma has low HP, it will have a tired idle animation. Like all characters, Rosalina's jumpsquat animation now takes three frames to complete (down from 5). Luma has more HP (50 → 60). Luma's respawn time has shortened and is dependent on the amount of players in the battle (12.5 seconds → 11 (2 players), 9 (3 players), 7 (4 players), 5 (>4 players)). Luma's attacks benefit from a 1.5x damage amplifier when Rosalina launches it away. When Luma is launched, it receives roughly 25% less knockback, improving its survivability. When opponents get near a detethered Luma, it autofaces them, in a similar way to Ryu's and Ken's mechanic. Rosalina walks faster (1.0835 → 1.138). Rosalina dashes much faster (1.632 → 1.795). Her initial dash is also much faster (1.5 → 2.035). The introduction of attack canceling benefits Rosalina more than other returning veterans, as she can make Luma perform a grounded attack while she performs an aerial, giving her unique attack options. Luma receives more knockback in general, making it easier to KO. Luma no longer stalls in place as long when performing attacks airborne. Rosalina is heavier (77 → 82), which increases her survivability, but also her susceptibility to combos. The first hit of Rosalina's jab has less startup lag (frame 8 → 5), The second hit of her jab deals more damage (1% → 2%) and both third hits of jab have less startup lag (frame 9 → 7). Both first hits of jab also have less ending lag (frame 23 → 21). The first two hits of Luma's jab deals less damage (2% → 1%). Luma's jab movement and range have decreased significantly, no longer pushing Luma forward. This hinders Rosalina's ability to space with jab. Luma's jab 3 knockback growth greatly decreased, removing its KO potential. Jab 3 also has a shorter duration (frames 9-11 (Rosa), 9-13 (Luma) → 7-8 (both)). Luma's rapid jab knockback growth greatly increased, making it a good killing option near the ledge. The final hit also has less startup lag (frame 9 (Rosa), 8 (Luma) → 6 (both)). Rapid jab deals much less damage (1.7% (Rosa), 1.2% (Luma) → 0.3% (Rosa), 0.1% (Luma)) greatly hindering its damage racking potential. The final hit also has a shorter duration (frames 9-11 (Rosa), 8-12 (Luma) → 6-7 (both)). Forward tilt deals more damage (6%/5% → 7.5%/6.7% (Rosa), 4.3% → 6.7%/4.5% (Luma)). Luma's forward tilt also has less ending lag (frame 39 → 38). Luma's forward tilt has a shorter duration (frames 8-11 → 8-10). Rosalina's up tilt has a larger horizontal hitbox, deals more damage when hit clean (8% → 10%) and has decreased startup lag with a longer duration (frames 9-17 → 7-17). Luma's up tilt also deals more damage (8%/4%/3% → 12%/6%/4.5%). Rosalina's up tilt has a weaker late hit and has less intangibility (frames 4-11 → 4-10). Luma's up tilt has more ending lag (frame 31 → 41). Down tilt deals more damage (4.5% → 5.5% (Rosa), 3.5% → 5.2% (Luma)). Luma's down tilt has more ending lag (frame 32 → 33). Dash attack has less ending lag (FAF 48 → 41). Luma's forward smash hitbox has less range but has increased knockback to compensate for the change. All aerials have less landing lag (11 frames → 8 (neutral), 20 frames → 16 (forward), 16 frames → 10 (back), 18 frames → 11 (up), 20 frames → 12 (down)). Rosalina has a new neutral aerial: she spins her wand around herself. Neutral aerial hits in front of Rosalina first, improving its usability and safety. It also has greatly decreased ending lag (frame 66 → 44) and the second hit of Luma's neutral aerial has less startup lag (frame 26 → 13). It can auto-cancel in a short hop and Luma can perform two neutral aerials in a short hop. It also deals more damage (5% → 10% (Rosa early), 7.5% → 8% (Rosa late), 4% (Luma front), 3% (Luma back) → 4.5% (Luma)). Neutral aerial has increased startup lag with a shorter duration (frames 9-34 (clean), 35-46 (late) → 10-26/27-33 (Rosa), frames 3-6 (Luma hit 1), frames 26-29 (Luma hit 2) → 8-9/13-14)). Rosalina's forward aerial has less startup (frame 11 → 10) and ending lag (frame 76 → 60) and auto-cancels in a short hop. Luma's forward aerial has a shorter duration (frames 11-14 → 11-13) and has more ending lag (frame 58 → 60). Luma's up aerial has more startup lag and both up aerials have a shorter duration (frames 8-29 → 8-19 (Rosa), frames 3-10 → 6-11 (Luma)). Up aerial's ending lag has also increased (frame 42 → 50), significantly worsening its juggling potential. Luma's down aerial has increased startup lag (frame 8 → 15) and ending lag (FAF 42 → 50). Luma Shot travels less distance, and Luma halts all momentum at the end of the move. Luma Shot can no longer be held indefinitely. The first two Star Bits have less startup lag (13/17 → 10/16). Star Bits have greatly increased range. The last Star Bit has more startup lag (21 → 22). Rosalina's head does not poke out during her 2-frame animation, making it safer when snapping the ledge. Gravitational Pull equips items instead of only pulling them in. Gravitational Pull has less ending lag (FAF 45 → 40). Gravitational Pull active frames decreased, making it not pulling objects after the animation has ended. Gravitational Pull range has been reduced. Rosalina's Final Smash uses a Grand Star during her Final Smash, and the name was changed to accommodate for that, going from Power Star to Grand Star. The change however, is only aesthetic, and the move overall functions the same as it did in SSB4. During Grand Star, an outer space backdrop temporarily appears. Grand Star pulls opponents in towards the multi-hitting star, making it more effective as a damage dealing attack. The Grand Star itself also covers more area, and grows significantly faster. Grand Star has a shorter duration. Due to this, Grand Star deals significantly less damage than what it was capable of doing in Smash 4. Luma's physics have been reverted to Smash 4 for the most part, giving it access to options that were removed in patch 1.0.0 and removing some undesired side effects. Luma advances once again with jabs thanks to the mechanical changes in its physics, albeit way less than Smash 4 jabs. Luma's up tilt deals more knockback. Down tilt sends Luma farther forward, increasing the range. This also removes a bug that made Luma bonk its head on the floor while performing the move. Dash attack connects more reliably. Rosalina can grab ledges faster after using neutral aerial and forward aerial. Neutral aerial has less startup lag (Rosalina/Luma: frame 10/8 → 9/7). Rosalina's neutral aerial connects more reliably. Smash 4 RAR back aerial that launches Luma forward when performed is back. Down aerial's meteor hitbox on frame 17 no longer has a sourspot, making it always spike regardless of positioning. Luma Shot has less ending lag when sending out (uncharged/all charges: FAF 40/34 → 35/29) and calling back Luma (grounded/aerial: FAF 26/28 → 22/24). Launch Star ledge grab size increased, (17, 27.5, -8, 13) → (17, 30.5, -14, 13) during the launch animation, (17, 27.5, -8, 13) → (17, 30.5, -11, 13) when the move ends. If Luma is close, Luma will move in front of Rosalina when using a reversed down tilt or forward tilt. Luma Shot deals less shield damage. Star Bits deal less shield damage. At the start of Grand Star, nearby opponents will be slowed more, and for longer. Luma utilizes a hit points (HP) mechanic. It has 50 HP (and ignores additional damage from 1v1 multiplier), and if it is KO'd either by losing all of its HP or by crossing a blast line. Another Luma will appear after 11 seconds in 1v1s, or 9 seconds in free-for-alls. Luma attacking independently as shown by a Skill Preview in Ultimate. Luma is controlled by the player instead of artificial intelligence. When launched away from Rosalina, Luma's attacks receive a 1.5× damage amplifier. The Luma will have a steadily glowing "ring" around it to signify that it is separate. The Luma will automatically face any opponents who get close to it. Even if Rosalina is incapacitated, such as being grabbed or buried, Luma can still attack. Luma: 1.5% Rosalina: Swings her wand twice, each creating a discharge of magic, and ends with a third magic burst from between her hands. Alternatively, the second hit can instead transition to a rapid jab consisting of Rosalina rapidly waving her wand in front of her, and ends with a large spark of light produced from a final flick of the wand. Luma: Performs a punch, followed by a kick, followed by a bicycle kick with the opposite foot. Alternatively, the 2nd punch can instead transition to a series of spinning punches that end in a corkscrewing headbutt. Ideal for punishing attacks that have little ending lag, though it can also be used for pressuring and zoning. Luma: 6.7% Rosalina: Spins, performing a double-footed roundhouse kick, which produces a trail of stardust. Luma: Performs a roundhouse kick. Luma: 12% Rosalina: Emits a miniature planetary ring that rises upward. Luma: An uppercut. Unlike Rosalina's attack, this can hit a foe standing in front of Luma, which can lead into an aerial follow-up. This attack is also notable for having the quickest startup out of all attacks available to the pair, quicker even than their jab attacks (this comes out on frame 3, as compared to Luma's jab on frame 4 and Rosalina's jab on frame 5). However, its limited reach and noticeable end lag mean it must be used carefully. Luma: 5.2% Rosalina: A low-angled dropkick, which creates a magical spark at her feet. Luma: 4.5% Rosalina: A lunging upward battering ram, which produces a trail of stardust from her head. Luma: Performs a diving tackle that ends with a back flip. Luma: 10.5% Rosalina: Shoots a spiral galaxy-shaped energy blast from her hands. Can be angled. Luma: Punches straight forward. Can be angled. Luma: 9% Rosalina: Performs a backwards-arcing back flip, hitting opponents with her head. A rainbow-colored trail appears to indicate the range. Luma: A jumping bicycle kick. Luma: 7.5% (front), 6% (back) Rosalina: A spinning shin kick which produces 2 spiral galaxy-shaped energy blasts on each side of her: first in the front, and then back. Luma: Kicks behind itself and then in front. Luma: 4.5% (front), 4.5% (back) Rosalina: Spins her wand around herself in a circle, emitting a trail of stardust. Luma: Kicks behind and then in front of itself. Resembles its down smash. Luma: 4.5% Rosalina: A double-footed bicycle kick. Her feet produce a galaxy-shaped energy blast, which leaves a trail of stardust. Luma: 6% Rosalina: Dropkicks behind her, emitting a galaxy-shaped energy blast. Luma: 6% Rosalina: Emits a miniature planetary ring above her. Luma: 7.5% Rosalina: Emits a miniature planetary ring below her. At the beginning, can meteor smash. — Grabs her opponent telekinetically. 1.2% Taps her opponent with her wand, creating a point-blank magic burst. 9% Makes the opponent float in front of herself with anti-gravity, and then flings them in front of herself. 11% Spins the opponent around herself once with anti-gravity, and then tosses them behind herself. 7% Flings the opponent into the air with anti-gravity. 9% Slams the opponent onto the ground with anti-gravity. 7% Kicks around herself while getting up. 7% Swings her wand around herself while getting up. 5% Kicks around herself while getting up. 9% Slides her legs up the ledge and kicks. Luma Shot 5% (uncharged), 16% (fully charged) Rosalina uses anti-gravity to launch Luma forward to perform a corkscrew battering ram. It is chargeable, with a fully charged Luma being invincible whilst traveling. Luma stops after either hitting something, or reaching the end of its path. By tapping the special button again, the Luma will return to Rosalina. Otherwise, the Luma will float back and forth periodically while separate (which is indicated by a steadily flashing "ring" around the Luma). However, Luma will be susceptible to falling into the lower blast line and thus be KO'd if it is off-stage and not recalled soon enough. Since Luma is involved in this attack, this move will have no effect during Luma's respawn time. Star Bits 3% (per star bit) Luma shoots three Star Bits forward. When used in sync with Luma Shot, it can allow Rosalina to keep opponents at bay. Like Luma Shot, this move will have no effect during Luma's respawn time. Launch Star — Rosalina uses a multicolored Launch Star to launch herself upward. It can be angled just before the ascent, making it capable launching her at a purely vertical angle, a nearly horizontal angle, or a diagonal angle. However, Rosalina's momentum carries over into her helpless state, which could prove dangerous if it is angled carelessly. If the Luma is present, she can have it do aerial attacks, making it hard for opponents to thwart her recovery. Gravitational Pull — Rosalina waves her wand around herself to use the Star Cursor to make nearby items or projectiles gravitate toward her. Gravitating projectiles come under Rosalina's ownership, which can result in projectiles damaging opponents who get too close. Any items that are pulled in (including those from special moves such as Link's Remote Bombs) will be immediately picked up/used/consumed/equipped. Grand Star 1% (loop), 12% (explosion) Rosalina summons a Grand Star, which then begins shooting smaller stars, and ends with the Grand Star exploding. The smaller stars knock opponents towards the Grand Star, which itself hits multiple times. Rosalina can act during the Final Smash. Rosalina poses gracefully and says "All right! ", while Luma circles her. Luma flies in after Rosalina motions with her wand, giggling. Luma jumps into Rosalina's arms, and she catches it. A flourished remix of the title screen track for Super Mario Galaxy, as well as the theme played when Mario or Luigi obtains a Power Star in that game. The opponents are characters from space or other planets. 6 Bowser Mario Galaxy Fated Battle Mario appears as a teammate. Final Marx ? Vs. Marx Mario appears as a teammate. Note: When used, the only Assist Trophy summoned is Starfy. Rosalina and Luma were among the fighters that were summoned to fight the army of Master Hands. During the opening cutscene, Rosalina and Luma were present on the cliffside when Galeem unleashed his beams of light. They attempted to fly away alongside Diddy Kong, but were hit by a beam of light, and vaporized, placing the two under Galeem's imprisonment along with the other fighters, excluding Kirby. Rosalina was one of the many fighters that fell under Dharkon's control upon Galeem's first defeat. She is found in the Realm of Darkness near the entrance of the Mysterious Dimension sub-area, where the spirit of Megaman.EXE must be confronted before getting to her. Rosalina’s Fighter Spirit can be obtained by completing Classic Mode. It is also available periodically for purchase in the shop for 500 coins. Unlocking Rosalina & Luma in World of Light allows the player to preview the first spirit below in the Spirit List under the name "???". As a Fighter Spirit, it cannot be used in Spirit Battles and is purely aesthetic. Each Fighter Spirit has an alternate version that replaces them with their artwork in Ultimate. Additionally, Rosalina makes an appearance in a few Primary and Support Spirits, and Luma appears on its own as a Support Spirit. Rosalina & Luma's fighter card. Rosalina and Luma on Summit. Striking Falco with her up air on Prism Tower. Striking Kirby with her up smash on Temple. High fiving Zelda on Prism Tower. Idling with the Bunny Hood equipped on Mario Galaxy. In her white-and-red dress with Pichu in The Great Cave Offensive. A dazed Rosalina with Mewtwo on Pokémon Stadium. Performing their side taunt on the Umbra Clock Tower. Rosalina & Luma being attacked by Venusaur's Razor Leaf on Saffron City. Rosalina & Luma’s video on the official website features a visual glitch: when Rosalina uses her new neutral aerial her dress goes abnormally high, revealing her legs disjointed from her body. One of the screenshots on the official website featuring Rosalina in a white-and-red dress and a seemingly dazed Pichu is a reference to the White Mage, a classic healing class from the Final Fantasy series. Despite Rosalina's Final Smash being a Power Star in her video like in Super Smash Bros. for Nintendo 3DS/Wii U, she instead summons a Grand Star in the final version of the game. Rosalina's entry on the official Super Smash Blog was on October 31st, one day off from the game's 11th anniversary, which is on November 1st. It's possible that this was done because the final Super Smash Bros. Ultimate Direct was held on November 1st, and to avoid Rosalina's entry overlapping with new info from the Direct, her entry had to be written earlier than intended. However, Japan, being 14 hours ahead of Eastern Standard Time, would have received the update on November 1st. While most other characters have the announcer say "(character) wins!" at the victory screen, Rosalina & Luma have the announcer say "Rosalina & Luma win!". The "(character) win!" audio clip is usually reserved for the Japanese version, though it is most likely used with Rosalina & Luma because of their two-in-one nature and name. Ice Climbers also share this distinction. Rosalina is the only Mario character whose animations are not mirrored. Despite having most of his animations mirrored, Luigi has different animations when using moves that involve Poltergust G-00, so he may not face the screen when he uses his grabs and his Final Smash. During the Army of Puppets cutscene, a puppet of Luma can be spotted with glowing red eyes like any of the others present. However, in gameplay when fighting a Rosalina & Luma puppet, only Rosalina has the red eyes, with any spawned Luma being as usual. This page was last edited on April 18, 2019, at 11:56.